I don&apos;t think I&apos;ll get through all of that. If anyone has any questions, comments, or thoughts, I&apos;d love to hear them. @ColinTheMathmo How does it usually go? You randomly go through this graph and talk about what&apos;s inside the vertices? @erou If I&apos;m preparing a talk I&apos;ll have this as a larger conext, then choose the subgraph I want to cover, then linearise it. In this case, though, I might leave open all the options and let the audience guide where we go. My intention is to cover DHMW and why it&apos;s interesting. That will require the subgraph above and below. 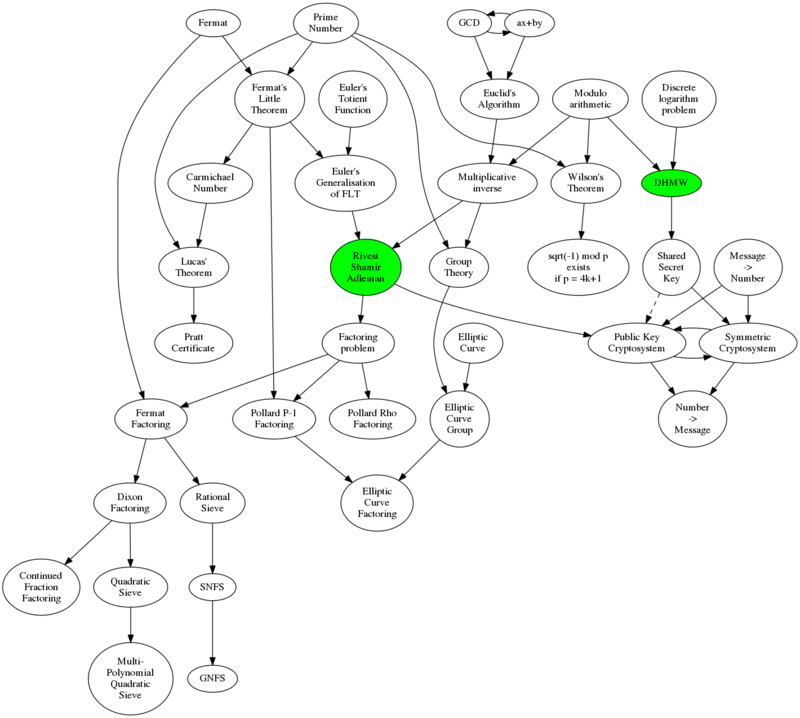 @erou It takes a little effort, but that diagram is easy to generate using GraphViz. I&apos;m thinking about a way of making it easier, but I&apos;m sure there are tools out there already to do this. You should do it - pick something and spread from there. @ColinTheMathmo Good luck structuring your talk! Will it be posted online anywhere? @acciomath It will be very free form and unrecorded, so I don&apos;t think I&apos;ll be able to write "the talk" yet. I might create something later. If so, I&apos;ll blog about it, so if you follow my blog then you&apos;ll see it. I&apos;ll also post a link to it here. @acciomath What would you like to see? Where lies your interest? @acciomath In essence, it&apos;s "just" Pollard p-1 in a different group. I don&apos;t know your background or how much you know about any of that, but I&apos;d be happy to dissect that comment and explain more. I&apos;m not an expert, and that comment actually contains most of what I know. @ColinTheMathmo to be perfectly honest, I don&apos;t know what Pollard p-1 is nor what it means to have it in a different group. I&apos;m just a senior in high school that does a lot of reading and learning on the side for fun. @acciomath Cool - always happy to have a chat about these things and help people understand more. @acciomath They are intriguing. I especially like CFrac and Pollard Rho. They&apos;re not the fastest, they&apos;re not the most modern, but they are unexpectedly elegant.